With an updated look and feel, your Seller Invoice is now the go-to place for a detailed and comprehensive view of your account activity. Personalize your Billing Details and group fees by item number. This section helps you learn more about commonly used invoice terms. It’s important to note that monthly fees are now referred to as “subscription and onetime fees” on you invoice. View a simple visual representation of your fees as a percentage of your sales each month. 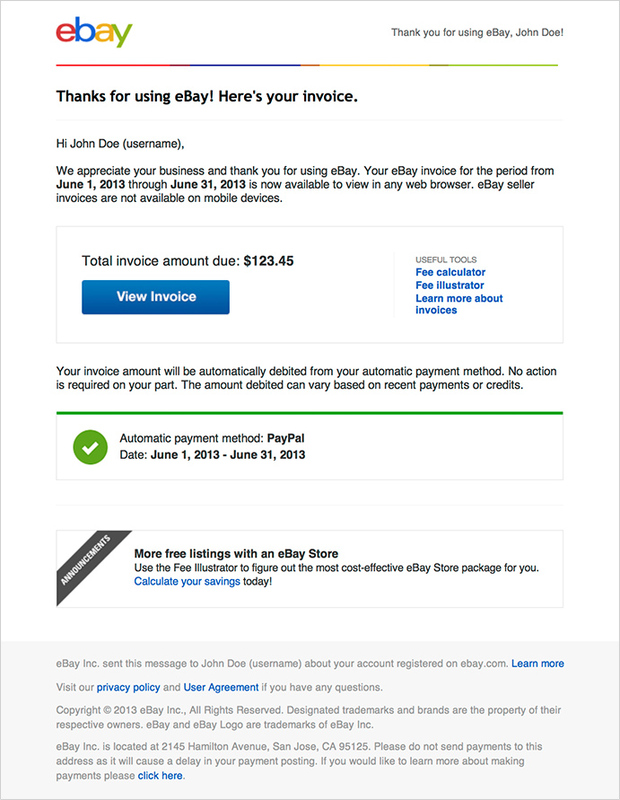 See your previous balance and the exact date that your last eBay payment was received. Detailed list of seller fees each month. Discover how much you’ve saved with Top Rated Plus Seller discount and other discounts each month, as well as any credits to your account. The new gray box below your monthly total lets you know when your automatic payment method will be charged. You can update or change your automatic payment method under My eBay. Announcements, Notices, Helpful Links, and Boost your savings have moved to the second page. Analyze a detailed list of your seller fees and the items they were applied to. Starting July 1st*, you will be able to group your fees by item number, date and fee type when your personalize your invoice. Find out how. *Personalization choices will appear on your next invoice. View all your subscriptions and other monthly fees. These include eBay Stores subscriptions, seller tool subscriptions, late fees and declined payment fees. The new email has been reformatted for a clearer, more actionable view of your account activity that will allow you to make sense of your eBay invoice and fees. The new email template introduces the “view invoice” button, which takes sellers directly to the page where the specific invoice can be selected and viewed. Sellers now have direct access to tools that will help them to learn more about eBay fees. The Fee Calculator gives an estimate of how much you will be charged when selling a specific item. The Fee Illustrator allows you to analyze if opening a store will benefit your business, as well as which store tier to choose from. The new invoice email clearly conveys account status information, using text as well as visual cues to show sellers if their account status slips past due (green– when all looks good, yellow– when the account is past due but an APM is still on file, and red– when the account is past due and there is no APM on file).